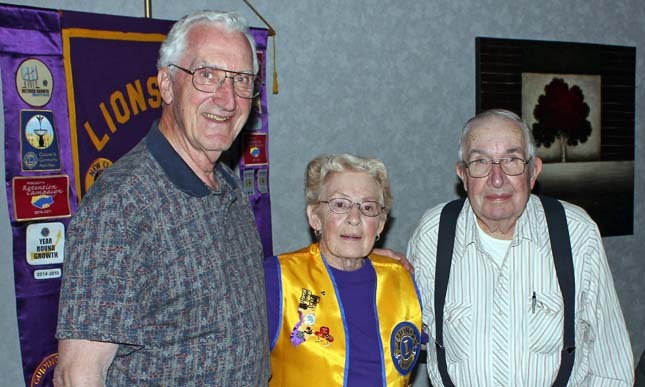 With less than a fortnight until Christmas, the Belle Fourche Lions Club gathered Thursday (12/14/17) for its final meeting of 2017. About two dozens Lions and guests arrived for the dinner meeting at Grap's Burgers and Brews in Spearfish. We were delighted to host District Governor Tim Brown for this meeting. "You have a great club," Brown opined in his opening remarks, reminding members that it was 100 years ago in Chicago, Illinois that Melvin Jones pioneered Lions clubs. Now boasting some 1.4 million members worldwide, Lions, International is pursuing a goal that would increase global membership to 1.7 million members. Importantly, Lions is working to reach out and touch the lives of 200 million people with our many service projects. Brown noted that International President Naresh Aggarwal has focused the theme of his term on service – We Serve. Lion Brown talked about two powerful initiatives that are underway for Lions International: the campaigns to battle diabetes and pediatric cancer. Both need our attention and continuing support. We can, he said, accomplish great things through the "Power of WE." Clubs need to ask themselves, what are we doing? District Governor Brown is challenging each club in the district to bring in new members and start a new "legacy" project that will serve and endure. 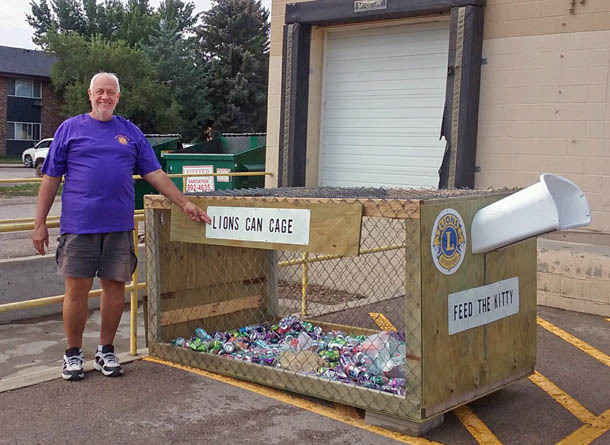 When informed of the Belle Fourche Lions long and continuing commitment to building park shelters in our community, he said that such a project is a perfect response to the challenge! 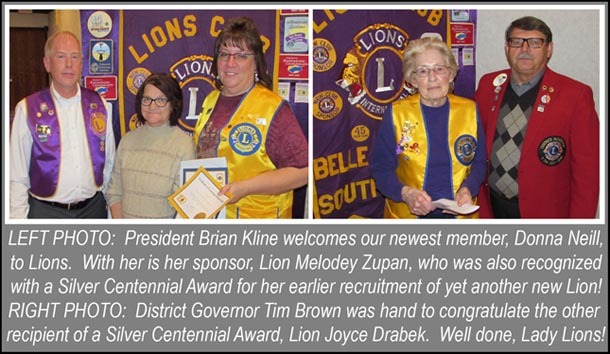 Several other Lions were recognized by DG Brown. Among those acknowledged for membership awards were: Lion Monty Raber, 10 years; Lion Tom Nary, 20 years; Lion Floyd Wennberg, 40 years; and a posthumous award to Lion Cal Geis, 45 years. 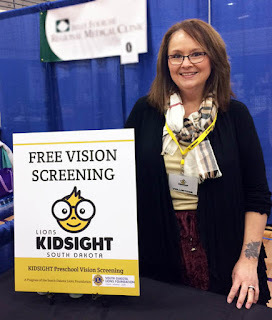 The vision screening at South Park Elementary and the Middle School on December 12th was apparently quite successful with approximately 300 children screened. The final report is not yet in, but several parents are being contacted so that their children can meet with an eye doctor. Lion Melissa Kraft reported that gift certificates have been purchased for the "Christmas Family. Members expressed appreciation for her leadership on this project. The 50-50 drawing was won by Lion Willert, whose two sons Logan and Blake attended the meeting as guests. A nice touch! Members were reminded that the Belle Fourche Health Fair will take place at the Belle Fourche Area Community Center on Saturday, January 13, 2018 from 8 a.m. to 2 p.m. Volunteers are asked mark that date on their calendars, since Lions will be conducting community vision screening. Members wanting to volunteer will have a final opportunity to sign up at our next meeting, which will be Thursday, January 11th at Grap's. Thanks to Lion Secretary Del Neumeister for his timely and comprehensive draft minutes for the meeting, which provided most of the substance for this story. 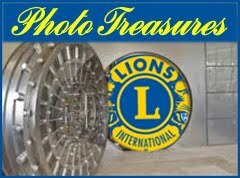 For a few photos from this meeting, the vision screening on December 12th, and other Lions activities, visit our Lions Gallery! Best wishes for a very Merry Christmas and a Happy New Year! Lions Del Neumeister and Brian Kline teamed up last night (11/10/17) to present a powerful program on the alarming growth of diabetes in this country – and around the world. It was a small but engaged group of Lions that gathered to hear the presentation during our regular Lion's meeting at Grap's in Belle Fourche. The impact on the disease is staggering: 422 million people around the world have diabetes, and it's estimated that by the year 2040, that figure will climb to 642 million. Diabetes is the sixth leading cause of death in women. Every seven seconds, a person dies from diabetes. It's astounding to realize that half the people with the disease don't even know they have it. 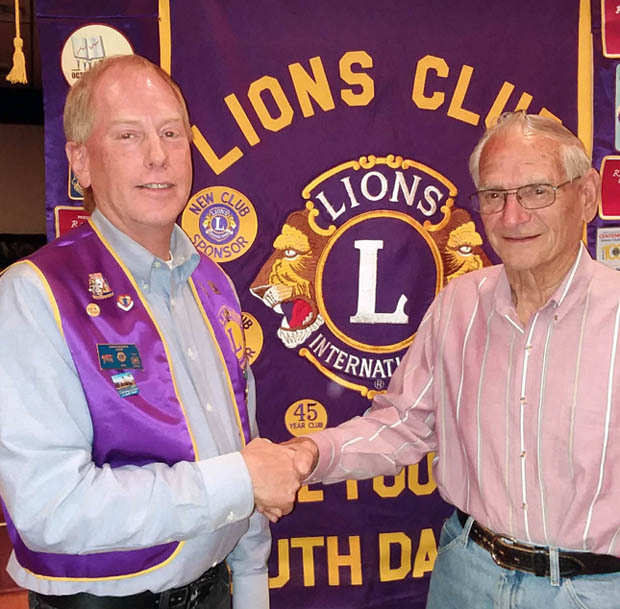 The program gave Belle Fourche Lions a head start on the "Worldwide Week of Service on Diabetes" (November 13-19) initiated by Lions, International, which is urging Lions Clubs such as ours to support those affected by diabetes in our local communities. Worldwide, Lions hopes to serve as many as 200 million people per year by 2021. Awareness comes first, and Lions Del and Brian helped us take the first step in understanding just how pervasive and threatening diabetes is. Each member talked about how diabetes has touched him or her. Some of our members have the disease. Others are borderline. The disease has claimed the lives relatives and friends – and the projections are sobering, especially in a society where obesity is running rampant and diabetes is not far behind. 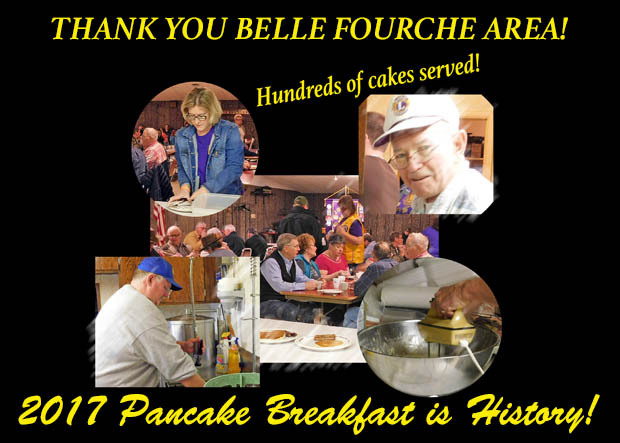 We CAN do something in Belle Fourche. Members discussed a variety of possible awareness programs (this program being a start!) We discussed way that Lions could help expand screening and testing for the disease. "Some very good ideas came forth," according to Lion Neumeister. Your ideas are needed, too! 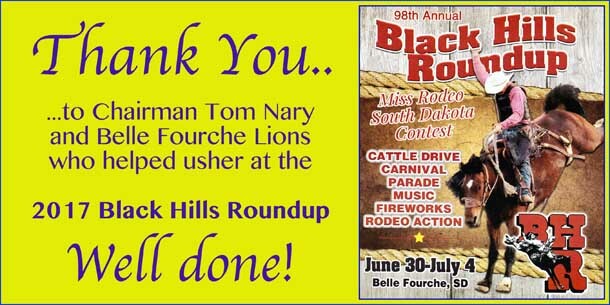 We trust all Belle Fourche Lions – even those who are inactive – will join us in this effort to raise awareness, and to seek prevention, detection, and control of this disease. Please take the time to explore online information from Lions, International about diabetes! Long-time Belle Fourche resident Dale Gillette (right) is congratulated by Lions Club president Brian Kline for his 50 years membership in Lions. 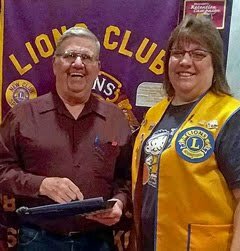 The recognition was a highlight of last week's meeting (10/12/17) of the Belle Fourche Lions Club. (Thanks to Lion Del Neumeister for sharing this photo!) 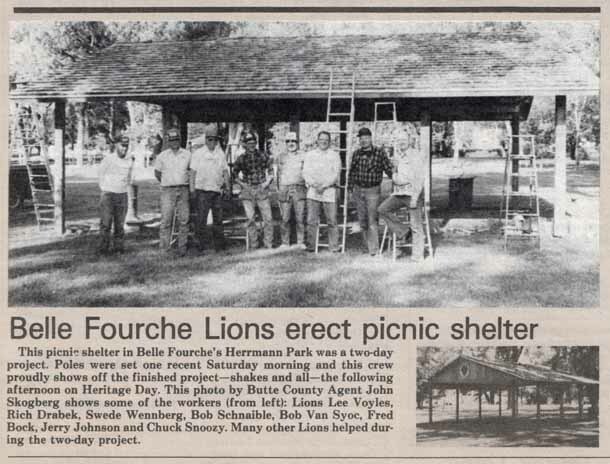 The following day, a group of stalwart Lions went to work on a new shelter adjacent to the Belle Fourche Area Community Center – nearly completing the structure over the past weekend. Check out photos of their work in the Lions Photo Gallery! Nearly two dozen Lions and their guests were on hand for the first fall meeting of the Belle Fourche Lions Club Thursday (9/14/17) at Grap's Burgers and Brews. It was a busy time as the club honored several members and also conducted a considerable amount of business. Leading the awards list were three Lions named recipients of the Melvin Jones Award. They included Lions Rick Walton, Joyce Drabek, and Del Neumeister. The award – named for the 1917 founder of Lions, International, Chicago businessman Melvin Jones – is one of the most prestigious given by Lions, which now has more than 1.5 million members in more that 200 countries. All three recipients have been active in a wide range of club programs. Drabek and Walton are past presidents of the Belle Fourche club, and Neumeister has served as secretary for several years. A quick perusal of the "Committees" tab at the top of this page will reveal the diversity and depth of club involvement by these three Lions. Each received a plaque and pin, and a heartfelt round of applause for their good work. Family members were on hand to celebrate their achievements, too. Check out our Lions Gallery for some snapshots of the event. Acknowledging the achievements of other Lions was on the agenda as well. 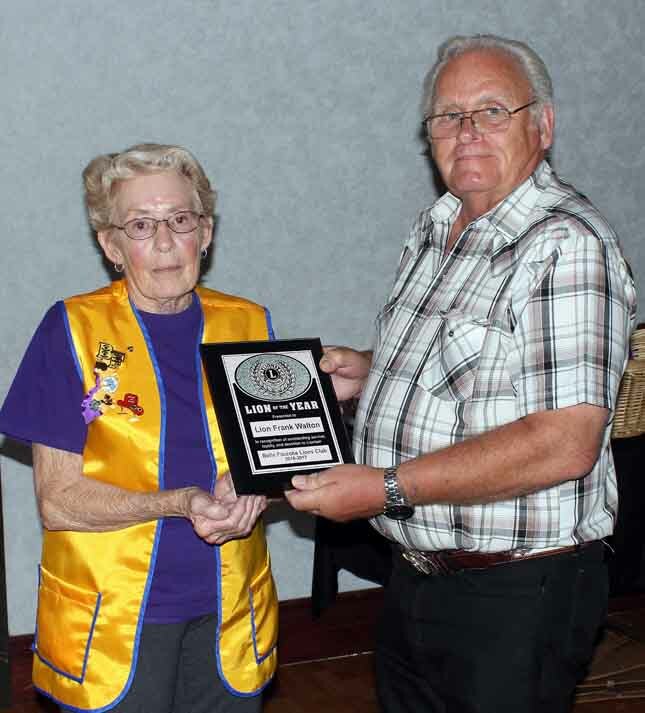 Lion Frank Walton (pictured at right) was presented with the Lion of the Year award for 2016-17 by immediate past-president Joyce Drabek. president Joyce Drabek acknowledged their service. 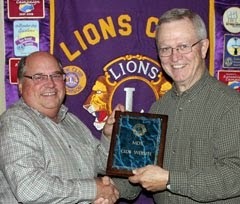 And Lions Chuck Livingston and Robert Drabek were recognized for a total of more than 100 years of service in Lions. 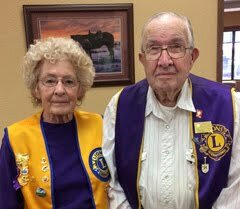 Elsewhere on this website, you'll see a short video profile of Lion Livingston, whose 50 years of service has been entirely with the Belle Fourche Lions Club – and marked by a perfect attendance record! Perfect attendance pins for the past year (2016-17) were presented to several Lions: Melodey Zupan, John Cooper, Joyce Drabek, Rich Drabek, Robert Drabek, Del Neumeister, Sue Neumeister, Frank Walton, Rick Walton, Deb Elliot, and Tom Nary. 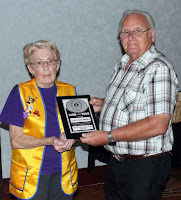 Past President Joyce Drabek presented Excellence Awards to Lions Tom Nary and Larry Miller. There was considerable discussion about ways the club might assist the many people adversely affected by hurricanes along the Gulf and Atlantic coasts. The club approved donating some $500 in two separate gifts to aid in relief operations. Also approved was $150 to each eye clinic in Belle Fourche to support their work on behalf of Lions. There was more, of course, and we invite you to scan through the draft minutes from our September 14th meeting to learn more. 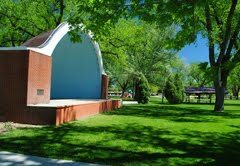 The next meeting for the Belle Fourche Lions Club is scheduled for Grap's on Thursday, September 28th at 7:00 p.m. Despite a bit of nasty weather and a slow Friday, it was a busy day Saturday (6/24/17) at Herrmann Park as car enthusiasts emerged for a fun day – and a bit of nourishment! Lions served burgers and soft drinks. 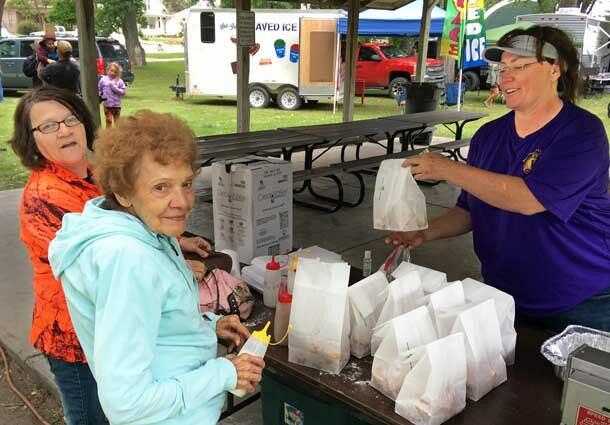 Above, Lion Deb Elliott serves fresh doughnuts to a couple of happy ladies. 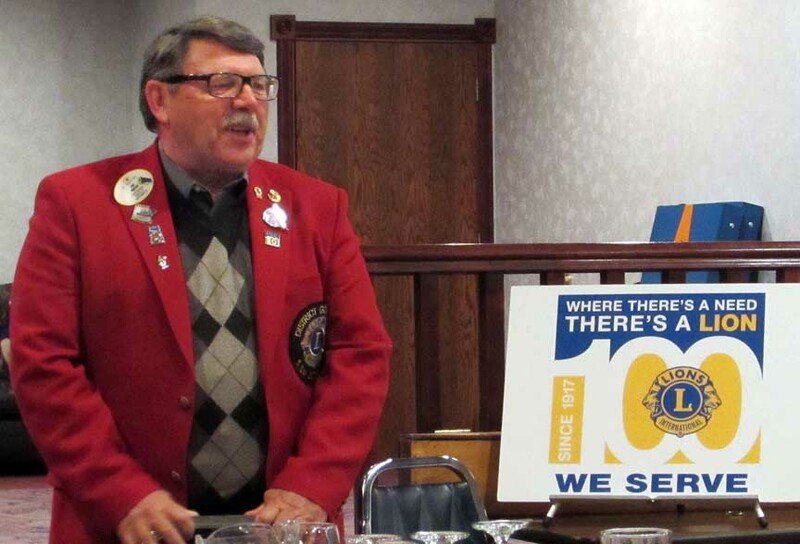 Lion Treasurer Rich Drabek reports that the club grossed close to $1,800. 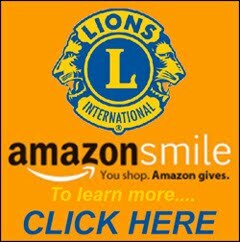 Net profits will help support our Lions projects! Thanks to all who turned out to help with this event. Congratulations Lion Chuck! 50 Years a Lion... and counting! It's hard to fathom the dedication and work that Lion Chuck Livingston has demonstrated during more than 50 years as a Lion! 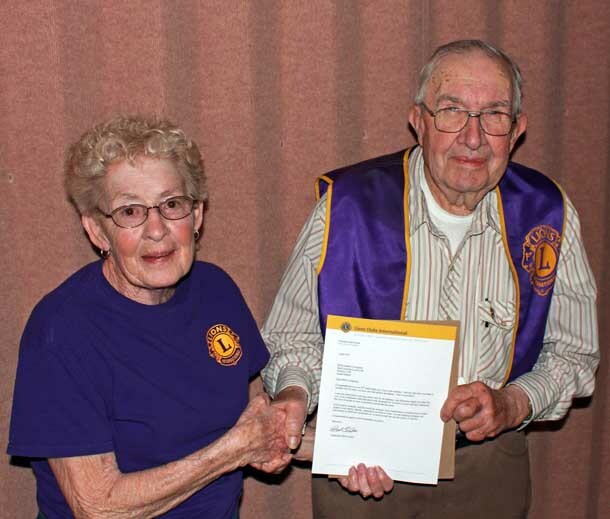 It was another special moment during our club meeting this week (4/13/17) as Belle Fourche Lions Club President Joyce Drabek presented Lion Livingston with a congratulatory letter from Chancellor Bob Corlew, President of Lions Clubs International. "Congratulations on your 50th anniversary as a Lions club member. And not only have you been a member for 50 years, you have also had perfect attendance. That is incredible!" wrote President Corlew. All of Lion Livingston's colleagues echo that sentiment. Congratulations, Lion Chuck.....and Well Done! An award, a project preview, and a busy meeting! Perfect Attendance pin for Lion Bob Drabek! A busy spring is shaping up for Belle Fourche Lions. Projects were outlined at our meeting this week (2/9/17) at Grap's Burgers & Brews. Among the first of several coming events is our Lions Pancake Breakfast, slated for Sunday, March 26th at the Moose Lodge. There's always need for Lion workers, so members are encouraged to contact Lion Robert Schnaible, who is chairman. This is a key fundraising effort for Lions and helps support many of our community service projects. After Easter, Lions will conduct a Vision Screening for Belle Fourche Kindergarten children. It's an all-day event scheduled for Tuesday, April 18. Again, volunteers are needed, so review your schedule and consider adding your name to the list! Fast on the heels of the vision screening comes our Lions Dodgeball Tournament on Saturday, April 22 at the Belle Fourche Area Community Center. Mark your calendars! With sights on things to come, Lions also took care of a bit of business at this meeting. 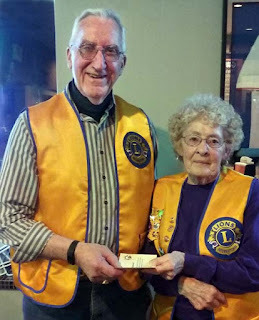 Lion Robert Drabek was presented with a perfect attendance pin from club president Lion Joyce Drabek (photo above). Congratulations Lion Drabek! Belle Fourche Lions supported the Middle School Science Fair held last week (2/7/17) and we're pleased to share the names of the two students who were recipients of $50 each for their winning projects. Dylan Tanninen was recognized for his "Effects of Ashes on Plant Growth" project, while Reese McKenna received her award for her "Electrolyte Challenge." Congratulations to both of these young people. 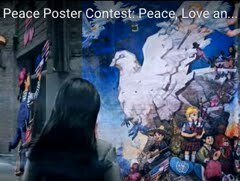 Our Lions "Peace Poster" competition is also being rolled out. You'll likely be hearing more about that from Chairman Lion Nary. Lions should be alert for a forthcoming survey regarding our meeting location/dates, and that topic will likely top the agenda for our next meeting, Tuesday, February 28. See you at Grap's! Thanks to Lion SecretaryDel Neumeister for his timely Minutes, which you can review in detail on our Minutes Page. IT'S ONLY 964 MILES FROM BELLE FOURCHE TO CHICAGO !! 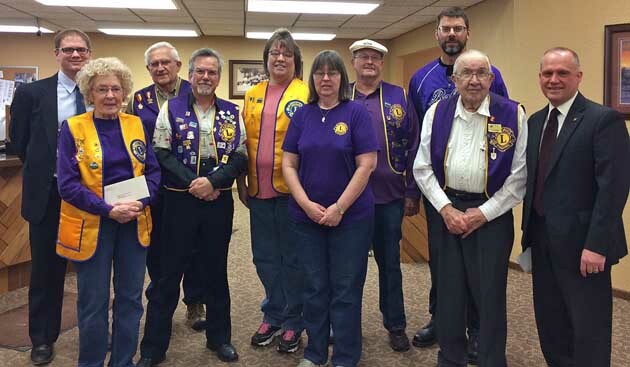 Eight members of Belle Fourche Lions Club joined president Joyce Drabek in receiving a $650 grant last week (1/26/17) from the Greater Belle Fourche Foundation. The funds will be used to support the many civic initiatives undertaken by the club. Shown (left-to-right) are Lions Kellen Willert, Joyce Drabek, Rich Drabek, Del Neumeister, Melodey Zupan, Sue Neumeister, John Cooper, Dwight Gubbrud, and Charles Livingston. First Interstate's Mike Tyndall (at right) made the presentation. It was a busy and productive day on Saturday, January 14th at the Belle Fourche Area Community Center "Health Fair." Belle Fourche Lions conducted vision screenings for more than 60 people – resulting in 11 referrals, according to Lions Club president Joyce Drabek. 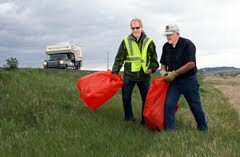 Pictured at left is Pinky Horner of Rapid City, appointed by the South Dakota Lions Foundation to serve as Vision Coordinator for District 5SW. Lion president Joyce will likely have a more complete report on the screening at our next meeting scheduled for Tuesday, January 24th at Grap's Burgers & Brews. 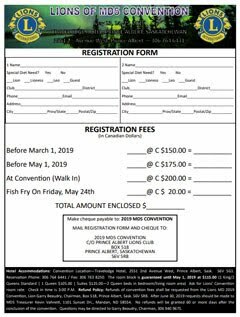 While it's too late for early registration, you could still make it to the Lions State Convention coming up January 27-28 in Fort Pierre. Where there's a need – there's a Lion! Members asked to rededicate themselves to Lions goals!